Dendrobiums (Den-droh-bee-um) are one of the largest genera found in the world with over 1,000 different species and even more hybrids. Dendrobiums (Dens for short) are a very desirable orchid type to have here in Florida. They are very easy to grow, many bloom twice a year, and their flowers often last for months. Some varieties are mature plants at 3 inches tall while others are over 3 feet tall. Large mature plants can continue to produce bloom spikes and stay in bloom nearly all year round. We once had a Den bloom for 17 months straight! They can be brought inside while in bloom as long as there is bright light. Then they should be put on the lanai so that they can grow a new stalk (called a psuedobulb) and get ready to bloom again. Summertime sun is usually too hot for them and they could burn. Winter sun is safe when filtered through the screen. Winter weather cooler than 50 degrees requires you to bring your dens in to a warmer environment for protection. Cool weather causes them to lose their leaves. Often the Dens we buy have been planted in a medium not good for them long term, but adequate for their blooming cycle. Watering should be done once or twice a week depending on the Den. Water on to the top of the medium and let it run out the bottom for a few seconds. Never allow your orchid pot to sit in a saucer with water in it. Orchids don’t like wet feet. The saying “Orchids should be fed weakly, weekly” is appropriate. A feeding once a month with a “Bloom Booster” is also recommended. At Sundance we also use a drop per gallon of Super Thrive when we feed. This product acts as a supplement of micro nutrients which all orchids need. After your Den finishes blooming, it’s time to decide if it needs repotting. Cut off the bloom spike where it comes out of the leaf or stalk. Do not cut off the pseudobulb, even if the leaves have fallen off, it is still giving nourishment to the plant and it can rebloom. Typically if the Den is in a small pot and appears to be crowded then repot into a slightly larger pot. Dens do like to be root bound so do not repot in too large of a pot. Our Dendrobium Mix is made of inorganic material to allow the dens to grow undisturbed for many years. Often, when you purchase a den it looks as though it is potted in a piece of bark or wood. Clean off the roots, removing any black or brown dead ones then plant the den in the mix using a rhizome clip to help stabilize it. Dens like to be pot bound and will grow and bloom better if they are not disturbed too often. We use clay pots for dens because the pot will dry more easily and it gives stability to the plant, the weight helping it to stand up better. Dendrobiums will give you years of enjoyment since they come in so many different sizes and colors. 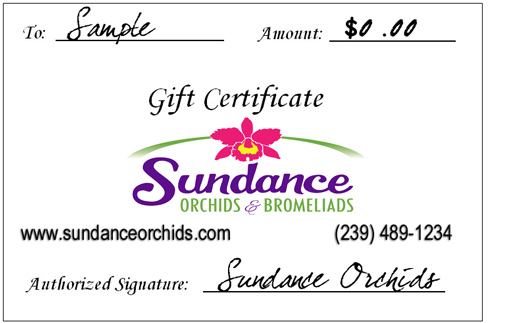 If you have any questions feel free to call Sundance Orchids and we will try to answer them.